Take an overnight flight from New York to Europe. Arrive in Rome and meet the Italian assistant at the gate. Board the bus and transfer to your hotel in Rome. The rest of the day is free to explore on your own or rest after the flight. Tonight there will be a welcome dinner at a local restaurant. Today’s included tour will be the highlights of Rome. This morning enjoy a guided tour of the Vatican City. You will see the treasures of the Vatican Museum, the Sistine Chapel, St. Peter’s Basilica, and St. Peter’s Square. This afternoon you will visit the Roman Forum and Coliseum. You will be amazed at the stories of classic Rome and the life of the Roman politician versus the average Roman citizen. You may take a free day in Rome or choose to take the optional tour to Assisi. The tour to Assisi will include a bus ride to Assisi (about 2-2.5 hours each way) and a guided tour of the hometown of St. Frances. The tour will include the Basilica of St. Francis, the Santa Chiara Church, and the Saint Mary of Angels Church. Tonight it is advised to walk to the Spanish Steps (about 15-20 minute walk) to join with the Italians in the celebration of the New Year’s. You will be able to see fireworks taking place all over the city and people rejoicing in the new year. This morning is free to sleep in after a night out on the town. This afternoon will be an included tour of downtown Rome. The tour guide will show and explain the importance of Navona Square, the Pantheon, Trevi Fountain, and the Spanish Steps. You may take a free day in Rome or choose to take the optional tour to Pompeii. The tour to Pompeii will include a bus ride to Pompeii (about 3 hours each way) and a guided tour of the excavations of the sight that was ruined when Mount Vesuvius erupted. You will see the city that has been frozen in time. After leaving Pompeii, travel to the historical city of Naples. 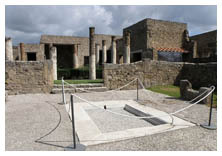 The highlight will be a visit to the Naples Archaeological Museum where many of the treasures of Pompeii are kept. You can also stop for a real Napolitano Coffee and typical "sfogliatella" cake while admiring the beautiful city center. You may take a free day in Rome or choose to take the optional tour of the sights of Rome. The tour of Rome will include the Borghese Gallery, The Saint Angelo Castle, and the catacombs located just outside the city. Tonight there is an optional dinner opera at the Tanagra Restaurant. Enjoy the music of the opera singers while you feast on a full course Italian dinner in a romantic setting. Head back to the Rome airport for a flight home or onto Malta for a 4 day extension. Take a flight from Rome to Malta. Arrive at our Mediterranean paradise where you are greeted by our tour host during our stay. We begin with a brief tour en route to the hotel, then free time to explore on your own. Today will be an excursion to the south side of the island. The tour starts with insight into the history of Malta. You will learn the importance of the trade of quarrying limestone. You will hear about the traditional methods of obtaining and using the rock and also see the modern methods as well. The tour continues with a visit to the fishing village of Marsaxlokk. The Marsaxlokk waterfront is lined with “luzzus” painted in traditional reds, blues, and yellows. The colorful harbor was the first Turkish landing during the Great Siege of 1565. There will be time given to shop at the local market. Lastly we will visit the Blue Grotto by boat. The sea caves have been formed by years of the water crashing into the rocky shores. The water is an amazing shade of blue that comes from the sky reflecting off the white sand bottom. You will visit Malta’s sister island of Gozo. Gozo has a very similar history as Malta but is unique in several ways. The island is greener and more picturesque and has its own character. You will visit temples of Ggantija, the citadel in Victoria, the bay of Xlendi, and calypso’s cave. Today you will visit the ancient citadel of Mdina. You will continue on to the capital city of Valletta to visit the Grand Master’s Palace and St. John’s Cathedral. St. John’s Cathedral holds art treasures such as the Caravaggio masterpiece, The Beheading of St. John. There will be time for lunch on your own before a transfer to the airport for a flight to Rome. There will be a farewell dinner at a local restaurant in Rome and overnight in the city. Take a flight home from Rome to New York.